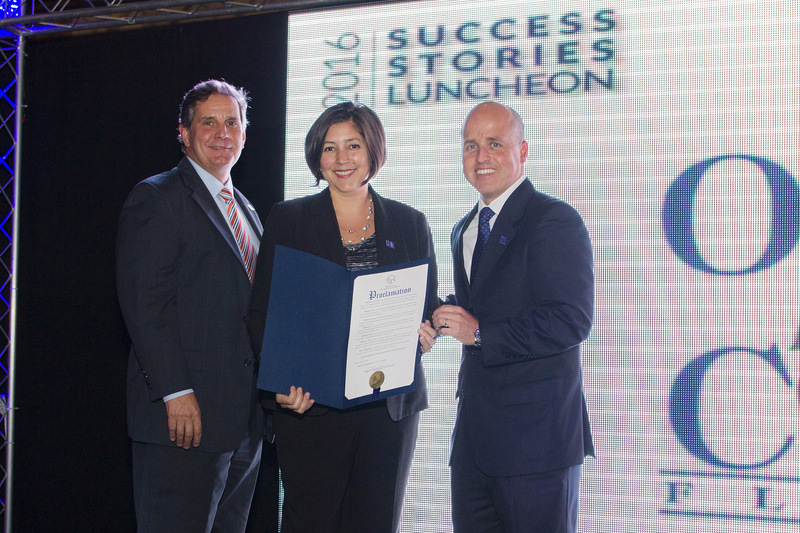 Orange County recently celebrated the 10th Hispanic Business Initiative Fund Success Stories Luncheon which marked a decade of strengthening Florida’s economy through business development and training for Hispanic entrepreneurs. The annual event honors and recognizes Hispanic entrepreneurs who have started or expanded a business with assistance from the Hispanic Business Initiative Fund (HBIF), Florida’s leading Hispanic economic development organization. This year, Orlando Montessori Bilingual Academy, Medical Services Corp., and Clippers Barber Shop were recognized as Success Stories at the luncheon for their accomplishments and contributions to Orange County’s economy. Orange County Mayor Teresa Jacobs provided the keynote speech at the event and commended HBIF for their efforts in fostering and encouraging economic growth in Orange County. With more than 350,000 residents of Hispanic descent, the Hispanic American population has made significant contributions in Orange County and continues to strengthen the region’s economy, community and culture. As of 2011, one out of five businesses in the Orlando area is Hispanic-owned and 29 percent of Orange County’s population is of Hispanic heritage. In recognition of this economic impact, the Board of County Commissioners has allocated over $123,000 to the HBIF. Christina Pinto has served as HBIF’s Board Chair for the past two years and said the organization has counseled more than 1,500 business owners who have come to HBIF for assistance on business plans and entrepreneurial ventures. Hispanic businesses in Orange County continue to expand and thrive helping to diversify Central Florida’s economy. This summer, Titán Products of Puerto Rico, a subsidiary of Empresas Barsan, established a new distribution center in Orange County, which will serve Florida supermarkets with more than 200 products, including frozen foods, grains, and non-perishable goods. Additionally, the Polytechnic University of Puerto Rico held a groundbreaking ceremony for its extensive building expansion in May. Both events were attended by Mayor Jacobs. To learn more about the organization, visit the HBIF’s website. A collection of photos from the Business Initiative Fund Success Stories Luncheon are available on Flickr for use by the media.